Dog really IS man’s best friend! An age old debate between owners of cats and dogs as to which pet is superior may have finally been settled, with canines coming out on top. Man’s best friend emerged victorious from a well-respected survey which discovered dog owners are twice as likely to call themselves ‘very happy’. The startling divide comes from a US survey designed to gauge the nation’s political and religious situation and is likely to cause uproar among feline fans. Those who look after both cats and dogs fall in the middle of the two groups. The US General Social Survey has tracked a broad swath of American trends since 1972, offering comprehensive insight into the evolving face of the country. Last year’s edition was the first time it included questions asking about pets and the relationship between owner and animal. It found non-owners of pets and pet owners have similar happiness levels but there is a noticeable divide within the latter. People were asked if they consider themselves to be ‘very happy’ and, of this group, 36 per cent of them were dog owners. In comparison, only 18 per cent of these ‘very happy’ individuals were cat owners. Dog owners also clocked higher figures for seeking comfort from their animals, playing with them and even thinking of them as part of the family. The difference between the two groups is more significant than the happiness divide between middle class and upper class people and almost as notable as the disparity between those who say they’re in ‘fair’ versus ‘good or excellent’ health. The findings reveal a strong correlation but can not be taken to mean having a dog causes people to be happier. It is possible a host of external factors play a role in the differences in happiness levels. Data in the survey also revealed dog owners are more likely to be married and own their own homes than cat owners. It is possible these then play a more pivotal role in the overall happiness levels of people than owning a dog. The survey covers a wide range of topics including gender and identity, current affairs, civil liberties, religion and spirituality and politics. It also discovered the number of Americans who identify as having no religion has risen 266 per cent since 1991. This number is now statistically similar to the number of Catholics and Evangelicals in the country. ‘Another (theory) is that the religious right kind of cleaved moderate Christianity and a lot of moderate Christians who were moderately attached said they didn’t want to defend Jerry Falwell … and all the anti-gay and anti- abortion religious rights leaders,’ Professor Burge said. As the ‘nones’ have ascended, the number of mainline Protestant Christians has fallen 62.5 per cent since 1982, to now account for just 10.8 per cent of the US population, according to the survey. The number of Catholics has gone up and down over the decades, cumulatively decreasing more than 4 percentage points from 27.3 per cent in 1972. However, that indicates an overall stability for that religion, despite the decades of sexual abuse scandals that have plagued the Church, Professor Burge said. A genetic analysis of the world’s oldest known dog remains revealed that dogs were domesticated in a single event by humans living in Eurasia, around 20,000 to 40,000 years ago. 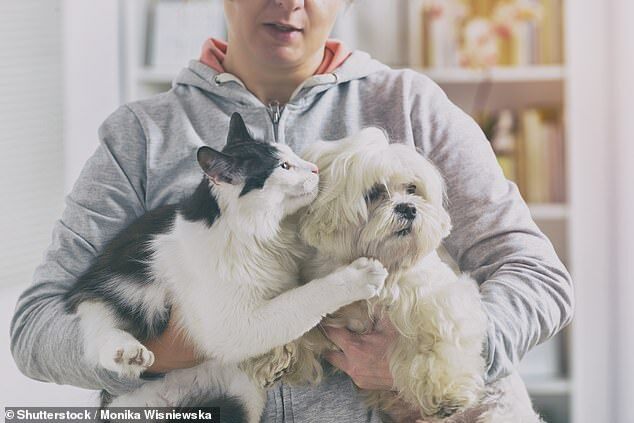 Dr Krishna Veeramah, an assistant professor in evolution at Stony Brook University, told MailOnline: ‘The process of dog domestication would have been a very complex process, involving a number of generations where signature dog traits evolved gradually. ‘The current hypothesis is that the domestication of dogs likely arose passively, with a population of wolves somewhere in the world living on the outskirts of hunter-gatherer camps feeding off refuse created by the humans.